The Vintage Village offers a wonderful opportunity for vintage sellers to establish themselves within a growing vintage community in an historic venue - the beautiful Victorian Covered Market Hall in Stockport's Old Town. We will make every effort to ensure that your day is enjoyable and rewarding. If you have any problems or issues, just seek out Alan, the organiser, and he'll be delighted to help you. Stall holders who fit our criteria (see below) will also be offered their own page in our traders section on this website. We will include your business description (or help write one for you), with links to your website, Facebook business page, Twitter, Instagram, blog and/or any other online site you might have, plus up to nine photographs of your goods. If you don't have any presence on the web this provides a useful online space to showcase your business, and if you do have sites our links will help drive traffic to them. And we hope that you will link back to our website here too! We consider vintage items to be those dating from the 1910s to the 1980s, and no later. Vintage pieces should be at least 20 years old. Items dating from before 1910 actually qualify as antique - being 100 years old or more - and they are equally welcome, although we don't advertise their availability. Please note that we are not booking any new craft traders. 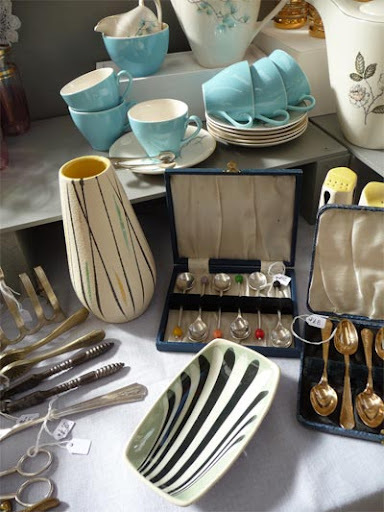 Commercially manufactured or mass produced modern goods - even if they are 'vintage' style - are not a good fit for this fair - there's a big clue about our primary direction in the name! Single pitches are approximately 6 ft x 6 ft in total area, which is room for a standard market table and a 6 ft rail or two 3 ft rails. Double pitches are approximately 6 ft x 12 ft in total area, with room for two standard market tables and two 6 ft rails. Standard market tables measuring 6 ft x 2½ ft are available for hire at £2.50 each per fair. The Market Hall is flooded with natural light during daylight hours, with windows right around the building and skylights in the roof. There aren't any dark, gloomy corners, which means there's little or no need for extra lighting. And on dingy days there's overhead lighting installed throughout the hall. There are, however, a very limited number of power sockets for lights available, and quite a few pitches which back onto walls with hanging space. Please state your requirements on the booking form - these are available on a 'first come first served' basis. 6 x 2½ ft tables are available for hire at £2.50 each per fair. All stalls have variable floor space for a clothes rail or two, please check when booking. Some stalls have hanging space behind, please request this on the booking form (limited availability). Power points are available for some pitches, strictly limited availability, charged at £2.50. Contact us about booking a stall right here. Look at Lily's stall at the The Village Vintage at Stockport Market Hall, 12th September 2010. Photograph by Sarah Norris. can't express how much I loved it, meeting lots of amazing people! Really looking forward to many more." "Vintage Village was amazing yesterday! Plenty of genuine vintage shoppers on the hunt for a bargain!" "Had *the* best day ever at Vintage Village today. Those guys know how to organise a great fair!" "What a brilliant fair! Great atmosphere and mix of people. the stalls had such a variety and I couldn't believe some of the bargains to be had. A great way to spend a rainy Sunday. I am busy making new treasures for next month's fair, can't wait!" "Such a good day! Our first fair surpassed our expectations." "We had a great day. The atmosphere is fantastic! Looking forward to the year ahead, I've only done two and it's really boosted business." Have you booked a stall with us? Are you wondering about precisely where and when you should arrive, unload, park your vehicle and so on? We have all the details for you in a leaflet which you can get here. If you're just starting out as a stall holder, or you would like some friendly advice and experience, we've compiled some tips to help make your time at our fairs more productive and enjoyable. Start reading our tips here.